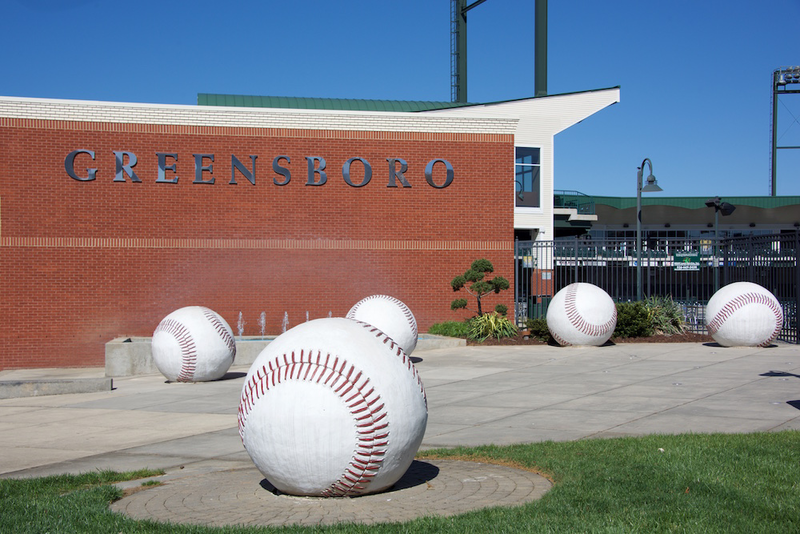 For lots of Greensboro baseball related art, go to the Grasshoppers’ Downtown Stadium! Everything in this section is somewhere in or on the Grasshoppers’ Downtown Stadium. Jim Gallucci and his team designed this unique gate for the Greensboro Grasshoppers Stadium. Look closely and you see the baseball bat design running through the metal gate. Brad Spencer created this mural for the Greensboro Grasshoppers’ Downtown Stadium using handmade bricks. It features stop-action baseball players made of raised handmade bricks. The First Horizon Park Baseball Plaques show a series of people who were baseball players in Greensboro or otherwise associated with our baseball program. Each figure has his own plaque with a relief carving of the figure eitherp laying baseball or at the baseball stadium.